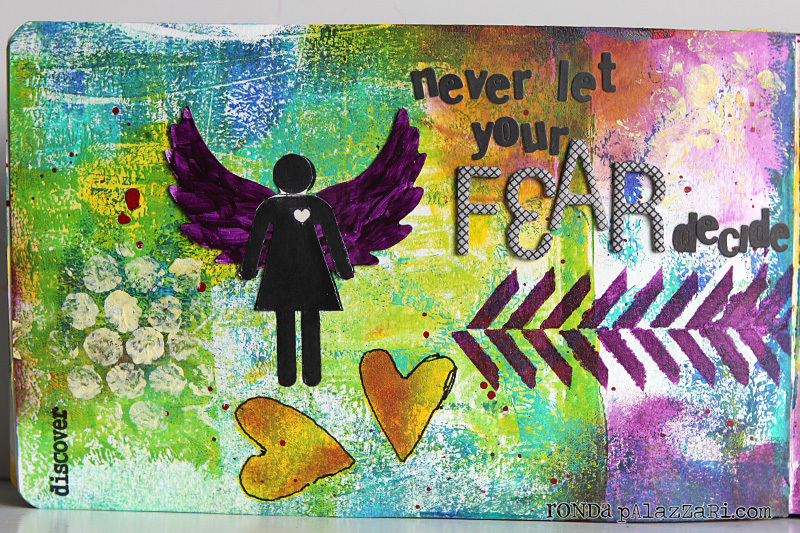 Artists in Blogland: Fall Fearless and Fly - Second Challenge! Fall Fearless and Fly with Ronda Palazzari! Welcome to Ronda Palazzari! We sent her the prompts and she WOW'd us with what she created! Ronda: As I have gotten older, it seems to me that it seems less of taking a leap and more like not letting fear decide my fate. There are many times when I worry or am fearful of the outcome, but if I let those emotions consume me I would never get anything done. Instead I take the “no’s” and “mistakes” as opportunities to learn and grow. To build my wings and fly. I took on the color prompt as well as the headline prompt. I love color but there are ones I always gravitate towards and ones I tend to use less. Purple is my challenge this go around. I have a hard time with purple. Turns out I have a hard time with tints of purple! I found that if I stick to more of the reddish hues of purple, then I can work well with it. I also pair it with some of my favorite colors and give it that pop by complementing it with yellow. On this page you will find layers of color as well as layers of gelatin prints. 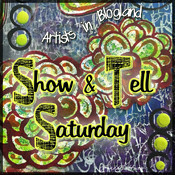 I used a variety of stencils on the background along with some splatters & stamps. I highlighted a few of the stenciled hearts by outlining them with a black pen. The wings of my potty girl had to be bold. Insert more purple since I had lots of yellow in the background. 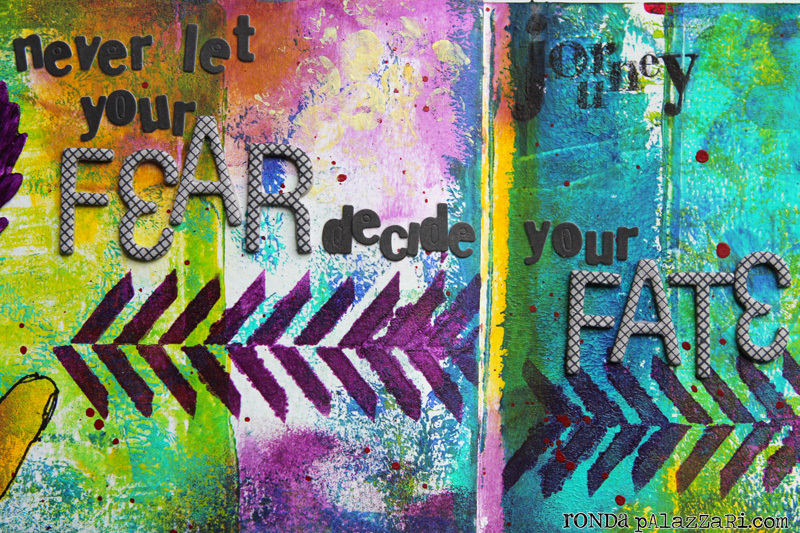 I love the staggered title, especially with the words “Fear” & “Fate” larger and in the grey color. I borrowed the title from the song “Kill your heroes” by Awolnation since it resonated my exact sentiments. 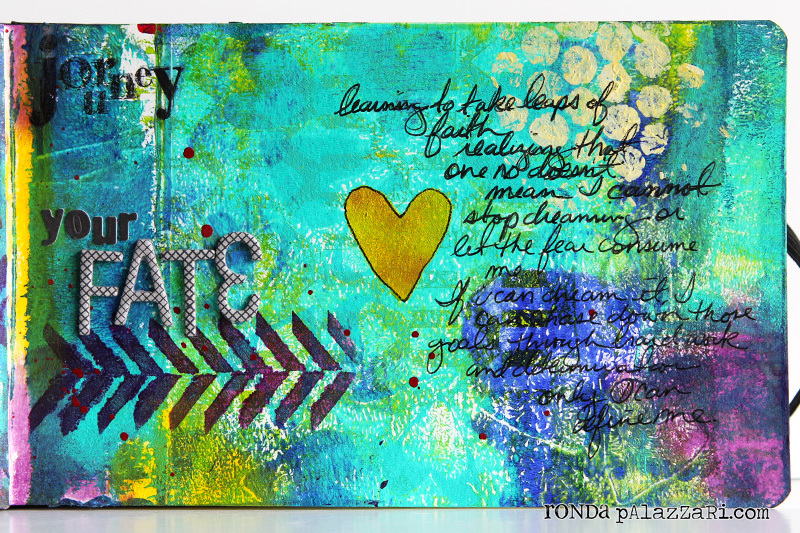 Thank you Ronda, for your beautiful and heartfelt take on this challenge and a fabulous prize! 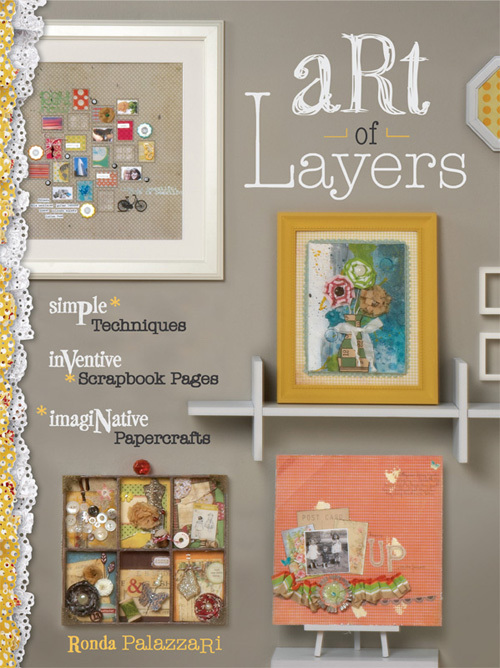 Everyone who links up their take on challenge #2 by October 28th will be entered to win Ronda's stunning book, Art of Layers. If you haven't read it yet you are in for a real treat. It is full of gorgeous photos showing you finished projects and techniques with clear step-by-step directions. 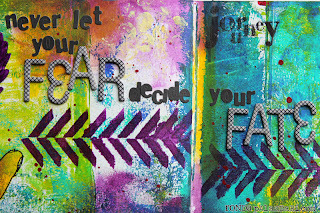 Ronda designs with Maya Road, Sizzix, Antiquated Collection, and Purple Onion Stamps. She has published in Artful Blogging, Creating Keepsakes, Memory Makers, Scrapbook Trends, and Somerset Magazines, among others. With Ronda, you never know if she will be sewing or getting messy with paints; her craft changes day-to-day. She continues to teach worldwide as well as providing inspiration and telling her dorky stories on her blog HelpMeRonda. 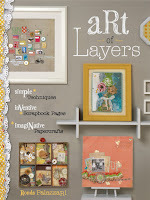 Link up by October 28 to be eligible to win Ronda Palazzari's book: "Art of Layers." You may link up to 2 times, but please only link up to work prepared for this challenge. 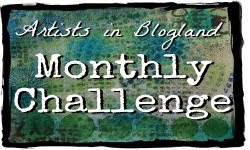 Please post the url of your blog post or flickr page that's specific to this challenge, rather than a general blog address. And please tell us how your work relates to the challenge! Congratulations to Jenny Grant - the lucky winner of our first Fall Fearless & Fly challenge, chosen by the random generator at Random.org! Please email your address to Jessica at corspokoli (at) gmail (dot) com and we will get your Crafters Workshop stencils, decorative flag and stickers by Jessica right out to you! 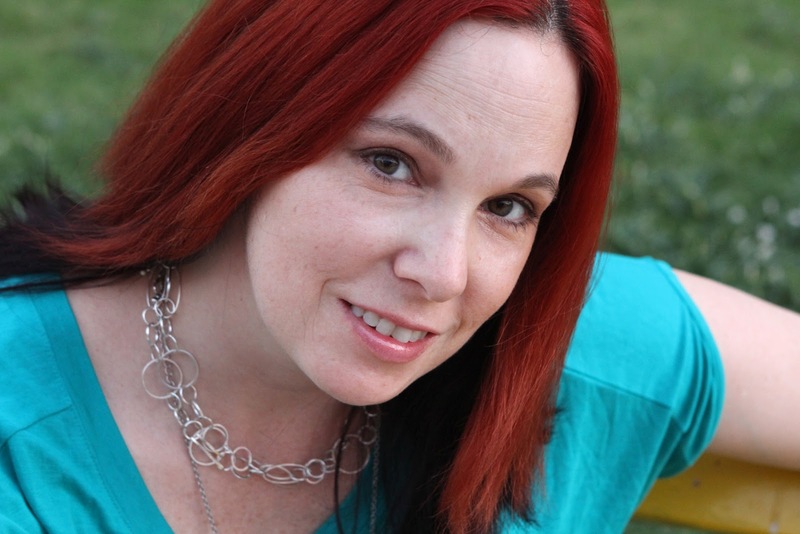 Check out Carolyn's and Jessica's response pieces in the linky list below. And on Monday, October 29, check in for Challenge #3 and the winner of this challenge! Wow, love this challenge and like Ronda, I have trouble with purple! Well if she can, then so can I... thanks ladies. Hi Jessica, LOVE this challenge. The title is perfect. Oh gosh, I'd LOVE to participate, but I'm hosting a challenge of my own this week. Found you trough The Fanciful Magpie. wonderful, thoughtful response from Ronda! Because some of our European friends have asked me - A wild goose chase is an idiom for pursuing something unattainable, or wildly out of reach. This quote can be read to mean that nothing is unattainable, or that whatever you are searching for has a meaning in your life that you haven't uncovered yet. Another translation of "wild goose chase" is "a futile quest." Because, in English, we use the phrase "wild goose," the quote turns the meaning of "wild goose chase" around. Hope that helps. The phrase "wild goose chase" comes from "Romeo & Juliet," when Mercutio says to Romeo: "Nay, if thy wits run the wild-goose chase, I have done, for thou hast more of the wild-goose in one of thy wits than, I am sure, I have in my whole five." I love the two pages, perfect color balance, together and separately. Wow, I love Rhonda's layers of gorgeousness! The colours are deep & vibrant - beautiful! Thanks for sharing another inspirational artist & her book with us. Love the colors you have used! The letters are beautiful too. I feel like 'fear' has been bound up! LOVE Ronda's journal spread! Congrats to the first challenge winner Jenny. I just added a quick project that came to me quite serendipitously coinciding with your quote prompt. I have the project intended for this challenge in the works and will link it up later. Ok my second project is in-thanks for the creative inspiration! Wow ~ Lots of wonderful colors that just jumped right off the page!! Love these! Thanks for sharing and Happy Monday to you! I made a mistake when I added my link above. See #29 and #30. Would someone be able to help me remove #29? 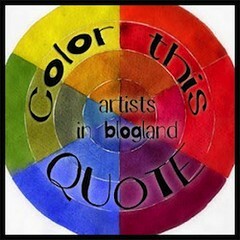 I must have used the Artists in Blogland link instead of my own. I've just taken a chance and added a post to my blog about taking a chance. Ha, ha. No picture (did that earlier) - just a response to the Headline Prompt. 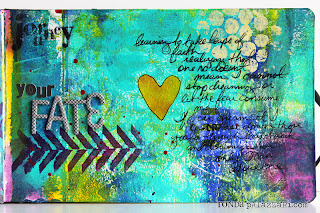 Ronda I love your pages, the shimmery colours are great and so is the quote that you used. I think you have done a wonderful job with purple! Your work is so rich in texture too. Rhonda's work is gorgeous, and her book sounds fabulous. I'm really enjoying the fall Fearless and Fly challenges. Blessings! Fab page; love the way fear and fate and the wings a lot. Thanks for another great prompt and amazing inspiration.